The time-line below is based up on an article written by Margaret Vickery in the 2007 members magazine celebrating the first 10 years of the Warwickshire branch of Butterfly Conservation. On the 1st March 2019, this website which you are currently viewing was launched. It represents a major upgrade to the previous website but continues to provide the primary means of gathering butterfly and day-flying moth records for the branch. It's the final day for our current website. Since 2012, this website has evolved and was one of the first in the UK to introduce online recording of butterfly sightings. The website has allowed the branch to gather a staggering 28,000 records consisting of 98,831 individual butterfly sightings between 2012 and January 2019. 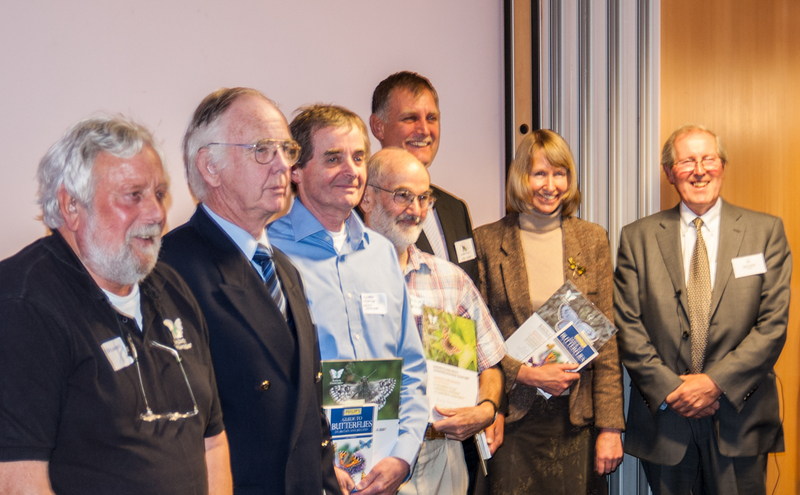 In February 2019, after celebrating 50 years of Butterfly Conservation in 2018, the Warwickshire branch reached an important milestone having for the first time reached 500 active branch members. Everyone from Butterfly Conservation Warwickshire would like to thank all of our members, past and present for their vital support since the branch was formed in 1996. Become a member of Butterfly Conservation Warwickshire. In early 2019, the branch twitter account passed the 1,900 follower mark. 2018 marks the 50th Anniversary of Butterfly Conservation which began in 1968. After a series of visits and assessments, which saw expert judges travel across the country, an independent panel of experts, led by Christopher Rodrigues CBE, the Canal and Rivers Trust selected its finalists for the 2016 Living Waterways Awards. The Warwickshire Branch of Butterfly Conservation is announced as the winner of the Natural Environment category for their work to save rare butterflies at Fenny Compton Tunnels. In October 2016, our membership had increased to 427 active members. 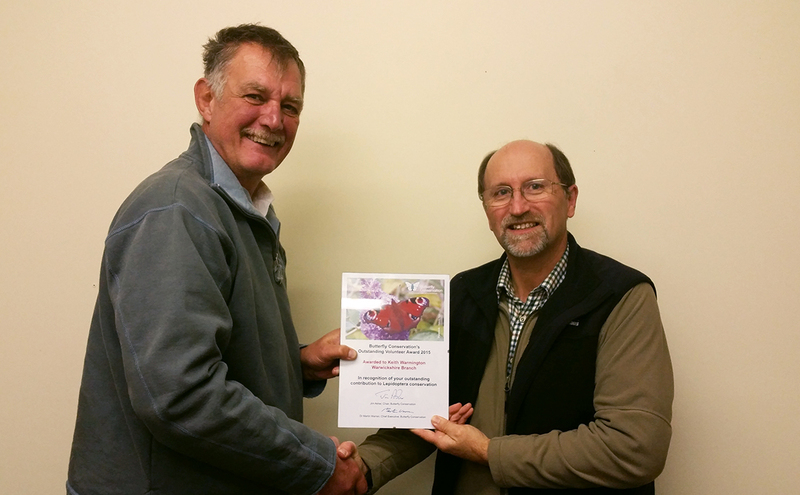 Keith Warmington was recognised in 2015 for his contribution to Butterfly Conservation by being given the Outstanding Volunteer Award by Butterfly Conservation. Keith has made significant contributions to Butterfly Conservation in Warwickshire undertaking various roles for the branch including Chairman, Treasurer and Branch Butterfly Recorder. Keith Warmington presented with Outstanding Volunteer Award. Margaret Vickery presented with Lifetime Achievement Award. Margaret was Treasurer, Membership Secretary and Newsletter Editor for the Warwickshire Branch from 1997 to 2002. She has also acted as Chairman and Branch Organiser and was appointed as Branch President in 2009. Margaret is an outstanding individual who has shown great commitment to the conservation of butterflies throughout her career. Warwickshire branch exceeds 300 active members for the first time. In 2012, a redesigned website was launched including brand new features. 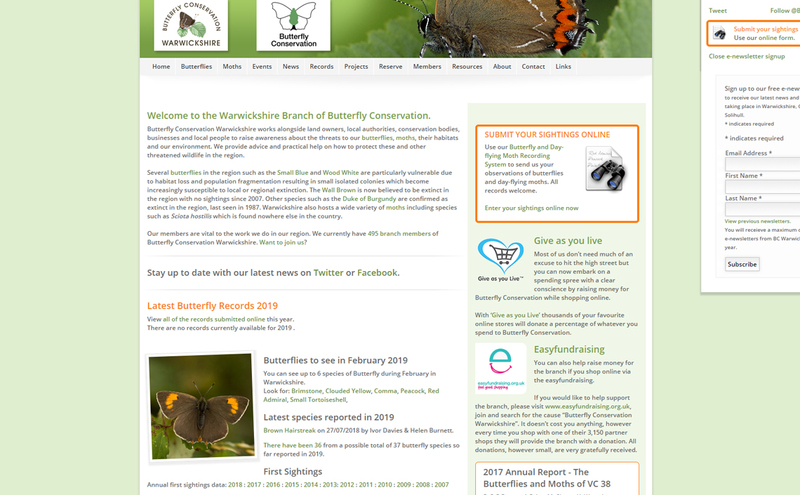 The new Warwickshire branch website was one of the first to introduce online recording of butterfly sightings. In 2011 the branch began to use Twitter to promote its work to a larger audience beyond the branch boundaries. 2011 saw the publication of our first annual report on butterflies and moths in our region. The report covered the 2010 recording season but also included data from the previous ten years since the publication of the Millennium Atlas in 2001. View all of our annual reports via Gatekeeper. In 2010 the branch membership had grown to over 200 members. At the National AGM in 2009, Margaret Vickery received an Outstanding Volunteer Award. Nationally she has served on the Conservation Committee, single-handedly run the Garden Butterfly Survey since 1990, written books and articles on 'Gardening for Butterflies', 'Butterfly Plants for the Garden' and 'Butterflies as Indicators of Climate Change' to name a few. Regionally she became a founder member of the West Midlands branch in 1979 and served on the committee in roles such as Newsletter Editor and branch Liaison Officer. Locally Margaret has worked as volunteer warden at Harbury Spoilbank. She started the first Warwickshire Butterfly Transect on the site in 1988 and her experience in establishing the West Midlands branch made her the driving force behind the formation of Warwickshire branch in 1997. Margaret Vickery receives Outstanding Volunteer Award. 2009 saw the beginning of two major conservation projects for Warwickshire. The Small Blue project designed to ensure major habitat restoration takes place in many sites in and around the Southam area with the aim to restore the fortunes of the Small Blue, Grizzled Skipper, Green Hairstreak, Dingy Skipper and Chalk Carpet moth. Major woodland coppicing and thinning will take place on sites around the greater Princethorpe area to make these areas once again fit for Fritillaries and other coppice-loving species such as the Wood White and Grizzled Skipper as part of the Midlands Fritillary Project. In 2009 the branch membership had grown to over 190 active members. In 2008, Phil Parr received recognition for 50 years conserving butterflies, moths and their habitats. He has surveyed every part of the Rugby District in detail and on many occasions, has been the only person that has driven the conservation work in this area. Throughout the 50 years Phil has given up most of his weekends during the winter months to undertake the vital habitat management himself and has been responsible for saving colonies of Grizzled Skipper, Dingy Skipper and Green Hairstreak and the last remaining Warwickshire site for the Forester Moth. 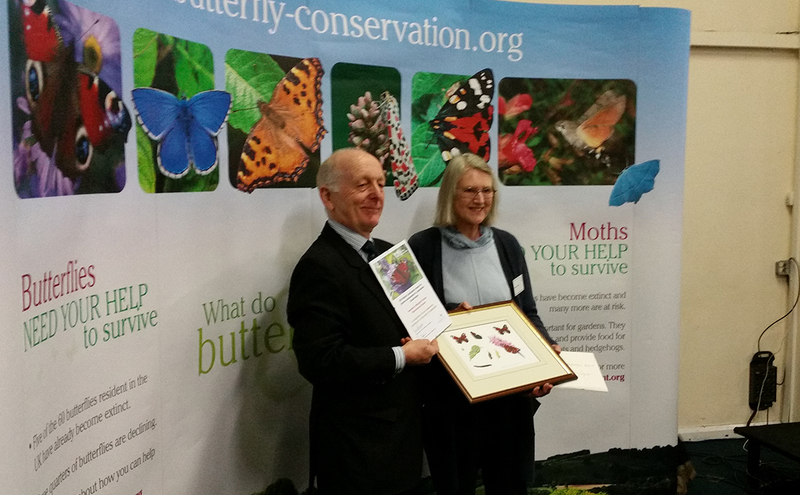 Phil Parr recognised for 50 years conserving butterflies, moths and their habitats in Rugby. In 2008 the branch membership had grown to 185 members. After 10 years, our branch logo was updated whilst retaining the original design principles and our much-lovedWhite-letter Hairstreak butterfly. 2008 marks the 40th Anniversary of Butterfly Conservation which began in 1968. 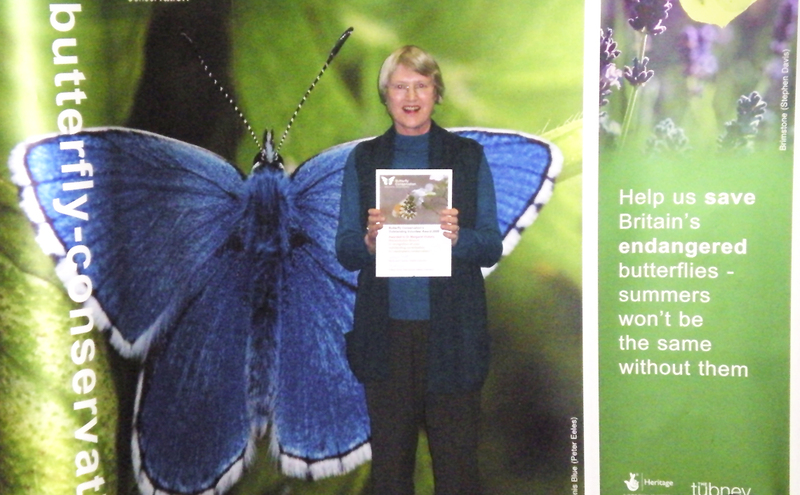 At the branch AGM in 2008, Margaret Vickery, our longstanding chair stood down from committee but continued to run the National Garden Butterfly Survey. She became our first branch President. 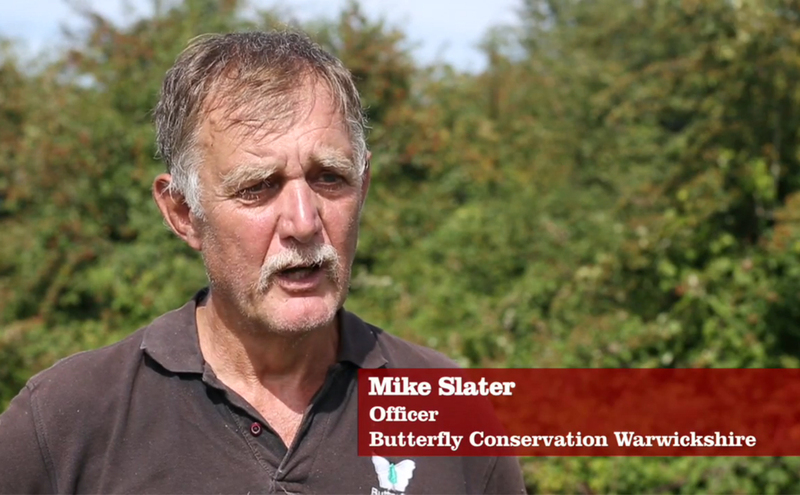 At the National AGM in 2007, Mike Slater received the Outstanding Volunteer Award in recognition of his substantial contribution to the conservation of butterflies in Warwickshire, especially the Ryton Wood Meadows Reserve. Mike Slater received an Outstanding Volunteer Award. Mike Slater continued to work alongside Warwickshire Wildlife Trust to bring to fruition the Princethorpe woodland project. 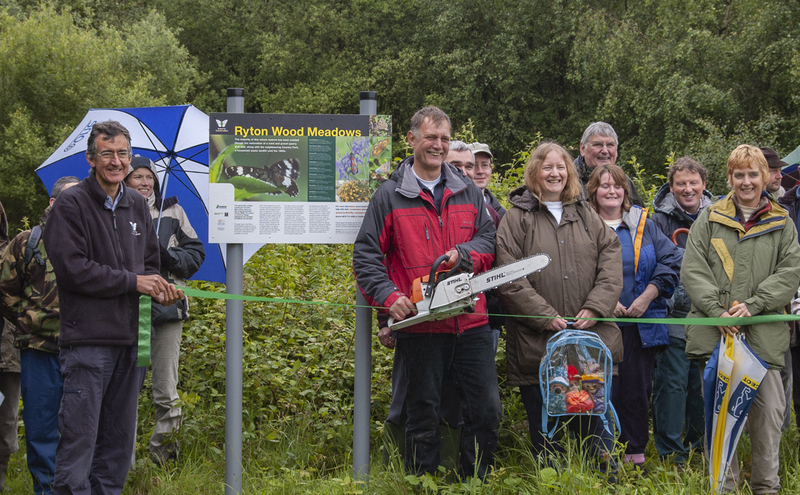 The aim of the project was to link all of the woodland in central Warwickshire so that wildlife including butterflies and moths can easily travel throughout the habitat. We have seen some wonderful results: Wood White and Silver-washed Fritillary butterflies have significantly increased in numbers. The Princethorpe woodland complex is also home to several rare moths such as Light Orange Underwing, Great Oak Beauty, Cloaked Carpet and Mere Wainscot. After several years of diplomatic effort with the owners LaFarge and Butterfly Conservation HQ, the branch was finally able to announce that it had acquired its first butterfly reserve. Ryton Wood Meadows Butterfly Reserve. In 2007 the branch membership had grown to 170 members. The publication of David Brown's book, The Larger Moths of Warwickshire, was the highlight of 2006 and the culmination of many hours dedicated work. 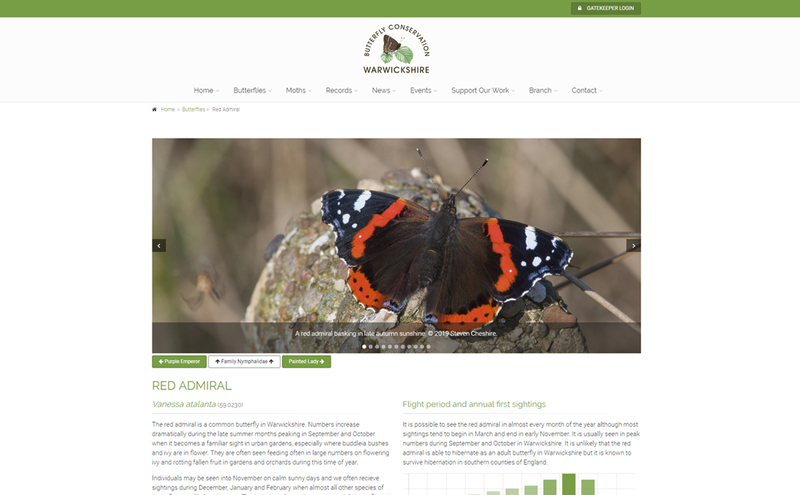 Butterfly Conservation Warwickshire entered the world of the internet when the first incarnation of this website was launched after several months’ development by Steven Cheshire. Since then, the website has become an important tool for the branch, communicating our work to a wider audience, leading the way for other branches to follow. The branch also produced its first full colour magazine in 2006. 2006 was also the year that Jane Ellis, West Midlands Regional Officer started her wide-ranging project to list, classify and ultimately conserve all the brownfield sites in the West Midlands. The landowners of several sites were contacted, and management plans drawn up. These measures benefit all species found in such habitats but especially the Dingy Skipper and the Small Blue. The tremendous recording effort involved in the production of the national Millennium Atlas resulted in a huge amount of information about Warwickshire butterflies and their habitats. This information was made more widely available when the Warwickshire branch published its first book 'Warwickshire Butterflies' in 2003. In 2002, Jane Ellis and Jenny Joy were appointed as West Midlands Regional Officers to produced strategies and plans of action to help save butterflies, moths and their habitats with the support of the Warwickshire branch. Val Weston and Alan Prior, both enthusiastic Warwickshire based moth recorders started to write articles on Warwickshire's moths for the newsletter and many of our members regularly attended moth trapping nights. Eventually the branch bought moth trapping equipment for the use of members with money raised by Val. In 2001 the country suffered the dreadful foot and mouth outbreak and as a result, the branch had to cancel its spring meeting at Brandon Marsh. At the AGM in 2000 Rosemary Plumbley resigned from the committee and Heather Warmington took over as meetings secretary. Due to his work commitments Mike Slater had to stand down as chairman/branch organiser and Margaret Vickery took over. Chris Johnson, a new committee member, took over as treasurer and, later became coordinator for transect recording, as well as organising our spring/summer programme of butterfly walks. In 1999 the branch membership had risen to 111 members. It is a butterfly synonymous with 'leafy Warwickshire' and the ancient Forest of Arden. It is found throughout the county… The determination of this shy little creature to overcome its decimation caused by Dutch Elm Disease is an inspiration to us all, and last, but by no means least, there is a white W on its wings. What could be more appropriate to Warwickshire?" At our inaugural meeting in March 1997 we had 50 members, enough to make the branch viable. Several members joined the committee and the role of newsletter editor and branch recorder passed to Keith Warmington allowing Margaret Vickey and Mike Slater to concentrate on their other roles. Richard Lamb also joined the committee as vice branch organiser and joint education officer alongside Rosemary Plumbley (meetings secretary and joint education officer), David Brown (moth conservation officer), and committee members: Neil Thompson, Dave Cole, Phil Parr and Jon Holmes. Jon Holmes, who worked for Warwick District Council was instrumental in setting up a number of local nature reserves in the District. He also instigated the creation of the butterfly garden in Jephson Gardens, Leamington. Our first branch (acting) committee meeting took place in the living room or Margaret Vickery's home in Kenilworth in the autumn of 1996 where the decision was made to inaugurate the new Warwickshire branch on 1st January 1997 (although the inaugural meeting was not held until 1st March that year). Mike Slater was appointed acting chairman/branch organiser and conservation officer. Margaret took on the duties of treasurer, newsletter editor and membership secretary. It was decided to stick to the boundaries of the old county of Warwickshire (Vice County 38) and thus the new branch covered Coventry, Solihull and Sutton Coldfield as well as parts of eastern Birmingham. Warwickshire was once part of the West Midlands branch of Butterfly Conservation which covered Gloucestershire, Worcestershire, Herefordshire, Shropshire, Staffordshire and West Midlands as well as Warwickshire. In the days when the society was small, such a large area was not too difficult to administer. As it grew, it became apparent that a more local approach was called for. County groups were set up with their own committees to concentrate on their own concerns although the overall policy and financial management remained in the hands of the West Midlands branch. It was not long before two of these county group committees felt they had the experience to run their own branches. First Gloucestershire and then Warwickshire left the West Midlands branch to become independent branches in their own right. Regional branches of Butterfly Conservation are managed by a voluntary committee who organise and take part in local conservation and other work, under advice and guidance from the society's conservation, development and administration staff and other national bodies. The Warwickshire branch membership continues to increase year-on-year as more people in our region become aware of the plight of our butterflies and moths, and the environment in which we all live. Through the branch network, countless volunteers carry out thousands of hours practical conservation tasks every year, managing our butterfly reserve at Ryton Wood Meadows and other important butterfly sites in the region, recording and monitoring of butterflies and moths, running and attending field trips, and raising awareness of butterflies and moths through events and fund raising.